MILWAUKEE (AP) — Build an early lead, get five good innings out of the starter and bring in the bullpen. The Milwaukee Brewers used that formula to win 11 straight games going into the NL Championship Series against the Los Angeles Dodgers. The three-time NL Cy Young Award winner will start for Los Angeles in Game 1 on Friday night at Miller Park. Once the Brewers take a lead, they’re hard to beat. Good luck getting to their lights-out bullpen. Milwaukee’s 3.47 ERA in relief was second in the NL only to the Chicago Cubs. The bullpen went 2-0 with a save and a 1.17 ERA in the three-game Division Series sweep Colorado. Corey Knebel can come in as soon as the fifth, usually lights-out left-hander Josh Hader in just about situation and Jeremy Jeffress in the late innings. All three relievers are capable of closing. Knebel and Hader are making their postseason debuts, while Jeffress’ playoff experience before this year was limited to just one inning in 2016 with Texas. The spotlight probably won’t faze the Dodgers, who are in a third straight NLCS for the first time in franchise history. The strategy at the plate doesn’t change, either, just because Milwaukee’s relievers are so good. Knebel, Hader and Jeffress, along with righty Joakim Soria, appeared in all three games against Colorado spread out over four days. The NLCS is best-of-seven, with the first four games over five days, so bullpen usage could differ. Chasing the starter will require building an early lead that might require the Brewers to dip into his bullpen earlier or more often than planned. Pressure in the NLCS? Maybe not for the Dodgers, who lost Game 7 of the World Series to the Houston Astros a year ago. Now that’s pressure. Outfielder Christian Yelich, making his postseason debut, hit .250 with a homer and two RBIs with two steals in the NLDS. 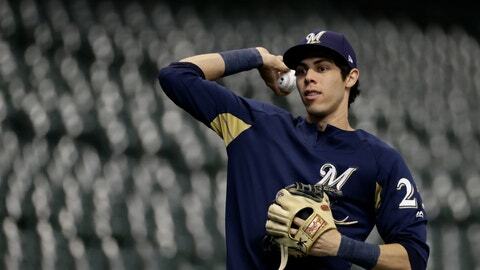 The smooth-hitting left-hander went on a tear in the second half, hitting .367 after the All-Star break with 25 homers to help lift the Brewers to the NL Central crown. When the series shifts to Dodger Stadium next week, the southern California native will be playing in a park where he used to watch games as a child . No bullpen day to open up the series for the Brewers. Milwaukee is going with left-hander Gio Gonzalez to oppose Kershaw in Game 1 on Friday night. For Gonzalez, it has been quite a rebound since being acquired in a deal with the Washington Nationals, going 3-0 with a 2.13 ERA in five starts with Milwaukee. An 11-year veteran, Gonzalez is 4-1 with a 1.89 ERA in six career starts against the Dodgers. One of the toughest left-handers in baseball, Kershaw (9-5, 2.73) hasn’t been quite as good in his career in the NLCS. He is 2-4 with a 4.65 ERA in five career starts in this round. The NLCS will begin in the park where All-Star Manny Machado made his Dodgers’ debut. After Machado was acquired at the All-Star break from the Orioles, the Dodgers opened up the second half of the season at Miller Park. Machado has hit .273 with 13 homers and 42 RBIs in 66 games with the Dodgers.